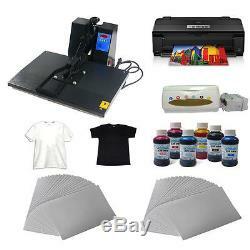 16"X24" Flat Heat Press DIY T-Shirts Package. ASC365 heat presses are widely used for heat transferring images to T-shirts, mouse pads, tiles and any other objects with flat surfaces and within 1 height , by foil, sublimation, inkjet and more. 16" x 24" Flat Heat Press. High quality for commercial application. Economical, yet perfect for applying all types of transfers including foils, sublimation, ink jet and more. Platen size: 16" x 24" (40 x 60 cm). Press up to 1 thick items. With spring assist and adjustable pressure setting, easy to open and close. Engineered handle design provides a 20%increase in pressure. Self leveling, silicone pad on bottom plate allows perfect contact with substrate. Adjustable shaky bottom plate provides even alignment on delicate objects. Standard electric plug for USA, Canada. Package size: 32.6"x29"x20.5(837452cm). Epson Artisan 1430 Inkjet Printer. The Artisan 1430 takes photo printing to the next level of performance, delivering brilliant, Ultra Hi-Definition prints as large as 13" x 19". And, with convenient wireless networking, it's easy to share your Artisan 1430 with others. Now, anyone on your network can create large-size, gallery-worthy prints, or even design and print professional looking CDs / DVDs. Photos are smudge, scratch, water and fade resistant thanks to Claria® Hi-Definition Ink. And, prints last up to four times longer than photo lab prints. Take your creativity further with the Artisan 1430 from Epson, the brand of choice among professional photographers. 20 sheets Premium Photo Paper Glossy. Ink Palette: Black, Cyan, Magenta, Yellow, Light Cyan, and Light Magenta. Ink Cartridge Configuration: 6 individual ink cartridges. Printing Technology: 6-colour advanced MicroPiezo inkjet technology optimized for photo printing. Minimum Ink Droplet Size: 1.5 picoliters. Maximum Print Resolution: 5760 x 1440 optimized dpi. Black: 2.8 ISO ppm. Colour: 2.8 ISO ppm. 4" x 6" borderless photo in as fast as 46 sec. 8" x 10" borderless photo in as fast as 1 min 51 sec. 11" x 14" borderless photo in as fast as 2 min 53 sec. 13" x 19" borderless photo in as fast as 3 min. CD / DVD Printing: Inkjet printable CDs and DVDs. Paper Sizes: 4" x 6", 5" x 7", 8" x 10", A4 (8.3" x 11.7"), letter (8.5" x 11"), legal (8.5" x 14"), 11" x 14", 12" x 12", B (11" x 17"), A3 (11.7" x 16.5") and Super B (13" x 19"). Maximum Paper Size: User definable up to 13" x 44". Smooth printing: vivid printing effect. Permanent chip, no need to change. Economical: save printing costs up to 95%. Reliable quality: adopt high quality ink, 100% marches the nozzle. 1 set of 16"x24" heat press (000008). 1 set Epson R1430 printer (012508). 10 sheets A3 Light Transfer Paper (002002). 10 sheets A3 Dark Transfer Paper (002003). C, M, Y, K, LC, LM. 2 sheets T-shirts 002086,002087. 16"x24" Heat Press (000008). 6 bottles C, M, Y, K, LC, LM inks. 1 pc dark color T-shirt (002086). 1 pc light color T-shirt (002087). Orders are processed from Monday-Friday; Not on the weekends & public holidays. Payments via eCheck do not clear immediately. Usually you will wait 5-7 days after checkout for it to clear. The item "16x24heat press machine A3 size printer paper ink ciss start-up kit t-shirt" is in sale since Thursday, September 04, 2014. This item is in the category "Business & Industrial\Printing & Graphic Arts\Screen & Specialty Printing\Heat Transfer\Presses".